In my last installment of police knives, I went over some neck knife options. One thing I am always concerned with in regard to on-duty carry of a knife is its retention. 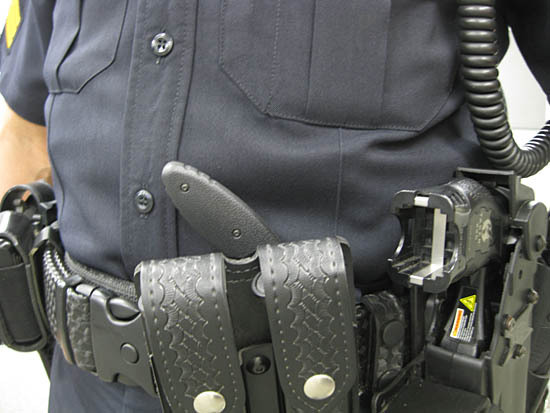 Wearing a firearm daily ensures that any call can become a gunfight (you brought the gun), but at least the officer’s sidearm is worn in a holster that has security features. Not so with a blade. This leads me to the KA-BAR TDI knife review. TDI is an acronym for Tactical Defense Institute, a law enforcement training facility in West Union, Ohio. The TDI knife was designed by Vietnam veteran and thirty-seven year sworn police officer Lt. John Benner. Mr. Benner is the President and Chief Instructor of TDI. My critique of the TDI knife is in no way meant to detract from the distinguished career or training concepts of Mr. Benner. In early 2010, I purchased a TDI and wore it threaded in my under-belt and behind the double magazine pouch of my duty rig, the TDI’s recommended location. It was fairly unobtrusive, but noticeable none-the-less. The more I wore it, the more self-conscious I became about its handle sticking forward. I tried it in the reverse, but it still felt exposed. It reminded me of the old cross-draw revolver holsters the Florida Highway Patrol troopers wore in the 1970’s. FHP’s holster rational at the time was that they transported prisoners in uncaged cars with the bad guys in the front passenger seat. Naturally a right-hander would want his firearm away from his handcuffed rider. Despite FHP’s good reasoning, that big Colt revolver’s wood grip jutting forward fairly begged to be grabbed by a perp (and sometimes it was). I began to feel the same way about my TDI. Thus, it went into the box of things I didn’t feel safe with on duty. Then I read a news story. On 12/24/2010, Austin, TX Police Officer Frank Wilson became involved in a foot chase with suspect Maurice Pierce. According to Austin Police Assistant Chief David Carter, during a struggle, Pierce grabbed a knife from Ofc. Wilson’s duty belt and stabbed Wilson in the neck. Though suffering life-threatening injuries, Wilson remained in the fight and shot Pierce during the attack. Wilson survived, but Pierce was found dead several blocks away. Because of this incident, Austin PD revised its duty knife policy to only allow officers to carry folding knives in a case on the belt or “secreted on their persons,” according to APD Commander Brian Manley. I do not know what kind of knife Ofc. Wilson was carrying. The circumstances and policy revision would indicate a sheath-mounted fixed blade. I do know that I feel that having a knife’s handle readily accessible to a suspect is the kind of officer safety I do not practice. I have gone back to pocket carry of a folder and boot carry of a small fixed blade. I have related the story of Ofc. Wilson to the troops I noticed wearing a TDI knife on duty. I leave it to them to decide how they feel about its carry. It is my opinion that the TDI knife’s one shortcoming could be fixed if the sheath had some sort of simple retention device similar to those used on handgun security holsters. It may increase the price a bit, but it would be well worth it. My next installment will be a discussion of some common and not-so-common police folding knives.